Rock Creek Wellness provides a cutting-edge approach to help both men and women in Kansas City regain quality of life through age-management services such as bioidentical hormone replacement, nutrition and exercise. There’s a concert inside your body. *Bioidentical hormones may be instrumental in slowing or reversing signs of aging. For both men and women, a healthy lifestyle and higher hormone levels often act like instruments in an orchestra; each one relying on the other to make beautiful music. But with age, hormone levels often decline, negatively impacting the body, mood, immune system, metabolism, growth and reproductive cycles. Changes in male and female hormones can even counteract the good nutrition, exercise and lifestyle choices we make, preventing optimal health and well-being, disrupting the concert inside your body. At Rock Creek Wellness, we believe the music must go on. 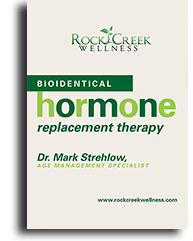 Mark Strehlow, M.D., a Kansas City board-certified family physician is an age-management specialists focusing on bioidentical hormone therapy and quality of life care. *He and our other doctors will assess your individual needs and create a custom medical plan that may restore your body’s natural rhythms. Dr. Strehlow’s personalized, integrated approach features a combination of bio-identical hormone therapy, nutrition and exercise. Bioidentical, or “natural,” hormone therapy replaces the hormones your body needs to function. Administration of hormones from other animals and synthetic derivatives has been linked to numerous health problems, including cancer. Only bioidentical hormones can follow the normal metabolic pathway and be broken down into other hormones and derivatives needed by the body. Bioidentical hormones are, molecule-by-molecule, exactly the same as the hormones present in the human body. Because hormones affect receptors throughout your body, hormone levels must be correct for you to feel your very best. *It is recommended that both men and women get a baseline hormone evaluation between ages 35-40. *For optimal health, an integrated approach including bioidentical hormone therapy, nutrition and exercise may be needed to restore your body’s natural rhythm. At Rock Creek Wellness, we believe it’s about the quality of life. With your first visit at our Kansas City hormone therapy center, you can anticipate completing a detailed health history to develop a customized approach to your well-being. *With each and every visit, you can expect to work with passionate professionals ready to help you live a happy, healthy, harmonious life. Learn more about bioidentical hormone therapy.